When we first came to Central Illinois, I relied on the grocery store, i.e. Walmart, for most of my groceries because it seemed as though we were miles away from any decent resource for produce. What I ended up with mostly was underripe, underflavored, shiny, beautiful fruits and vegetables that had been transported thousands of miles, sprayed with pesticides and herbicides and rendered practically inedible. 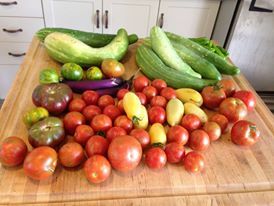 As I have spent more time here and have become more interested in locavorism and organic produce, I have found a great wealth of resources for fruits and vegetables at my disposal, literally in my back yard, or close to it. It’s called a CSA, which stands for Community Supported Agriculture. The principle is basic. A farm asks for subscriptions for a share of their crop. In return for those subscriptions, the subscriber receives a box of fresh produce, or a share of produce, every week, featuring the freshest and best produce available from that farm that given week. While specific details may vary, one thing is the same across the board. No matter what CSA you use, you are guaranteed to learn about different types of vegetables you won’t ever see in grocery stores, you’ll get the best tasting produce you will ever find, and you will likely never buy vegetables from a grocery store again, save for those times in the dead of winter when your options are limited, depending upon where you live. Many CSA’s pride themselves on their organic growing practices, however, due to the high cost of the certification process, most of these farms are not “Certified Organic.” Many of these farms will also offer farm fresh eggs and milk. Cost?? Well, cost can vary, but the one we belong to is roughly $350 a year and generally half is due up front and half at the end of the growing season, which goes from May thru October. In the beginning, you’ll get a lot of the same things, asparagus, lettuce, onions. Then, beginning in June, and contingent upon the weather, the diversity becomes astonishing. They fill your box based upon your preferences. You will send in a sheet with your likes and dislikes based upon everything they grow. If there is something you hate, like brussel sprouts, they won’t include them. Some of the more unusual things that we have gotten that I have truly enjoyed learning about and have never seen in a grocery store are garlic scapes, herbs like Anise Hyssop, varieties of potatoes like Kennebec and summer squash like Cousa and Pattypan. As summer progresses, you may start getting more vegetables then you ever thought you could eat, but what you will find is that you’ll start eating them more and enjoying them in many different preparations. Vegetables don’t have to be boring. Don’t just steam or boil them, saute them in olive oil and a little butter, roast them or grill them. Add spices and combine them with fresh herbs. Eat them raw, eat them cooked, but just eat them. You’ll feel better and you’ll feel like you have really been a part of your local community. For more information and a database of CSA’s across the country, go to http://www.localharvest.org/csa/.